Have you ever been dreaming of a big beautiful Thanksgiving feast, only to find out 2 weeks before hand that one of the key participants (ie your husband) has to be out of town for work? Bummer, huh? Well that is no reason to give up on your dreams or for him to have to miss out on the turkey fun. So you decide to jump in head first and host a Thanksgiving 48 hours later. This is a true story, in case you haven’t picked up on that already. The short title of this post is Thanksgiving. 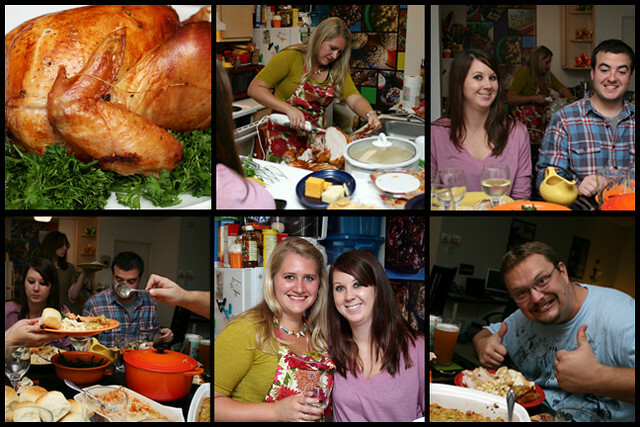 The long title of this post is The Last Minute Thanksgiving: Planning, Preparing, and Eating a Thanksgiving Meal in 48 hours (and still have time for 2 loads of laundry). So let’s just jump right in, shall we? The very first step to this process is to give yourself a break. Don’t put too much much pressure on yourself. Patty (the Millionaire Matchmaker) often tells her clients to come up with a list of 5 non-negotiables and to be prepared to negotiate on other things. Why? To keep from having a mile long list of things they have to have which essentially means nothing will ever make them happy. So think of your Thanksgiving plan like this. What are 5 things that are really important to you, and what are some things you might have to negotiate to keep your 5? I love to bake, I love to cook, I love it even more when I do it all from scratch, but there wasn’t enough time to make everything from scratch. I gave myself permission to take a few short cuts, like store bought pie crust. So just relax! This should be fun! Now that you’ve taken a chill pill, it’s time to do your quick plan. First, your guest list. How many and what, if any, special requests or needs do they have. My group wasn’t too big (7 total) and the only special request I had was to keep it close to tradition (and have an awesome pumpkin pie). This brings us to the meal plan. Make a list of the foods you want at your dinner. Go back to the previous paragraph and remember to not put too much pressure on yourself. The only recipe I hadn’t already tried was the turkey, so I picked one that wasn’t so intimidating. I found an awesome recipe (without brining) from a very trusted source. Then get all of your recipes together in one place. Also go through your dishware and decide what pieces to use for what dishes and make sure you have enough flatware. Now that you have your guest list and meal plan, make a grocery list. Use your recipes and check your cabinets, don’t assume you have enough flour, off the couch and look! Then check your list. Check it twice. Heck, check it 3 times. There isn’t a lot of room for extra grocery trips in the 48 hour Thanksgiving. Oh, and remember, you’re going to need a fresh turkey (which’ll be better than a frozen one anyway). I got mine at Whole Foods, but Trader Joe’s also has fresh turkeys and they were cheaper (would’ve been nice to know before I panicked and went to Whole Foods). If you don’t have either of those stores then check your white pages and call around. Cheese plate with crackers –what’s easier than a cheese plate? Hummus and pita chips – Gotta love Trader Joes hummus! Salted Herb Roasted Turkey – No brining! Yay! Mashed Potatoes – Pre-cut the potatoes the day before and soak in cold water. 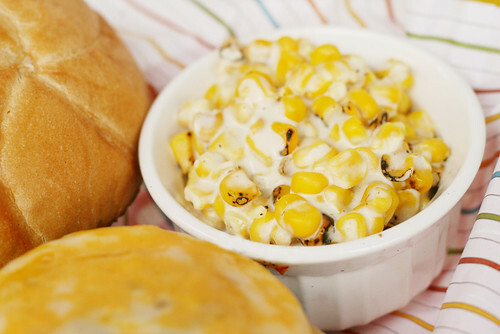 Creamed Corn – CROCKPOT! Throw it all in when you put the turkey in the oven and let time do all the work! Zesty Carrots – Totally prepped the day before. Day of only requires a 20 minute bake. Soft Yeast Rolls – This was one of my non-negotiables. If it’s not that important to you, buy some already made from the store! *Herbed Compound Butter – Totally prepped the day before. Next, you need to work out a time-line. Things that can be done on day 1, things that can be done on day 2 and things that need to be done the day of. Once you place the work in the correct days, start working the hourly time-line for the day of. It’s easiest to start working backwards. For more ideas on how to do this, check out Annie’s Eats. She has an excellent Thanksgiving planning post, which served as a good reminder for a few things I almost forgot about! To see a breakout of my days and time-line click here. That’s it. Can’t wait for my next chance to host! Do you know what today is? Friday, September 23rd, yes, but more importantly, the first day of fall! There might not be any leaves changing color or a crisp in the air, but I can still enjoy one of my favorite parts of fall. Pumpkin. 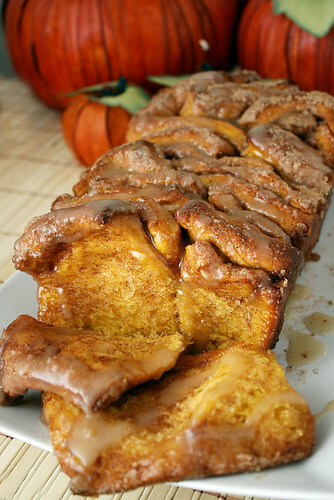 I can never wait for the official start of fall to bake with pumpkin and this year was no exception. I’ve already made my favorite pumpkin blondies and last weekend I whipped up something special to share with all on this special day. And oh man am I excited to share it with you. 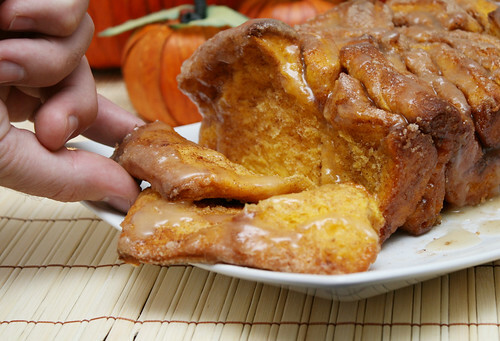 The light yeasted dough reminds me of a doughnut and the warmth from the rum glaze just screams fall. I hope you enjoy it as much as we did! *The recipe I used called for just a 1/4 tsp of rum but I really wanted to be able to taste the rum, so I upped it to a full tablespoon. It was just right for my taste, adding a nice warmth to the glaze. If you’re not into rum you can sub a teaspoon of vanilla extract. In a saucepan over medium-high heat, brown 2 tablespoons of butter, letting it bubble up and turn a dark golden brown but being careful not to allow it burn (turn black). 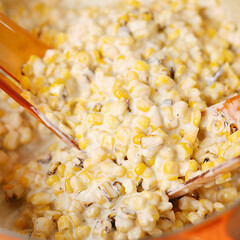 Once browned, remove the pan from the heat and carefully add the milk, return to stove and heat through. **** Pour the milk and butter into the bowl of standing mixer (fitted with a dough hook) and allow to cool so it is no longer hot but also not cool (about 100-110 degrees F). Once it has reached a warm but not hot temperature add the yeast and 1/4 cup of sugar and allow to proof (this can take up to 8 minutes, the top will look foamy and the liquid cloudy). Then add the the pumpkin, salt, and 1 cup of flour. Stir until combined then add the rest of the flour 1/2 cup at a time and knead for 6 minutes, until the dough is smooth and elastic and just slightly sticky. If the dough is too moist, add extra flour 1 tablespoon at a time. While dough is rising, brown another 2 tablespoons of butter. Add the sugar, cinnamon, and nutmeg and mix well. ** Making sure sugar evenly absorbs the butter. Set aside. Next, grease and flour a 9×5 loaf pan and set aside. When the dough has doubled in size, punch it down and flip out onto a clean floured surface and knead with hands for 1-2 minutes. Roll dough into a 20×12 inch rectangle. *** Evenly sprinkle the dough with the cinnamon sugar mixture and press into dough with palms of the hand. Cut the rectangle into 6 strips. Lay strips on top of each other and cut each strip into 6 even squares (cut in half then each half into thirds). Stack strips vertically into the loaf pan. 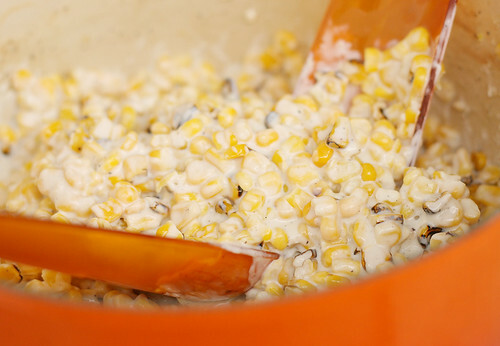 Cover the pan with a clean towel and let rise for 30-45 minutes. To prepare the glaze, heat the butter, milk, and brown sugar in a small saucepan. Bring to boil then immediately remove the pan from the heat and stir in the rum and powdered sugar. **Of course I didn’t properly read this section of the directions… I was supposed to melt the butter and brush the dough with the butter then adding the sugar on top of the butter (instead of mixing it all together and sprinkling) but it worked my way so that’s how I am listing it. It’s really your call! *** If dough is difficult to roll out, cover with a towel and allow to relax for a few minutes then try again. **** My milk was room temperature. Adding it cold to the butter can result in clumping. Willow Bird Baking called for removing the butter from the pan, then heating the milk, then adding the butter back to the milk. I was lazy which is why I skipped that step. You can also heat the milk separately in the microwave if you’d like. 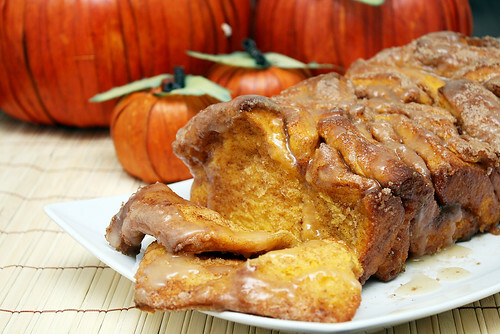 Do you love pumpkin in baked goods?? Here’s some more! What happens when your photo shoot starts to take too long!